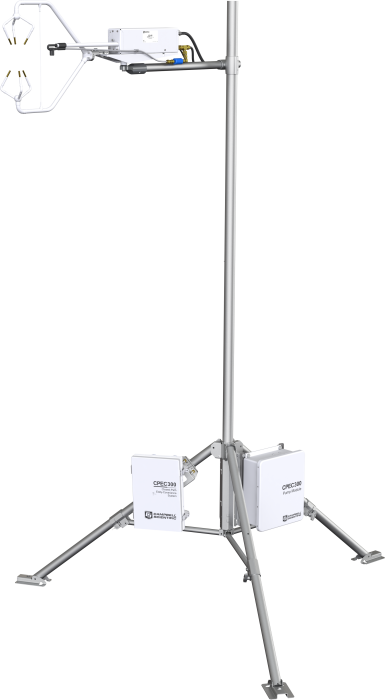 The CPEC300 with EasyFlux™ is a turn-key, closed-path eddy-covariance (EC) flux system for long-term monitoring of atmospheric-biosphere exchanges of carbon dioxide, water vapor, heat, and momentum. A complete system consists of a closed-path gas analyzer (EC155 closed-path gas analyzer), sonic anemometer (CSAT3A sonic anemometer), data logger (CR6 datalogger), and sample pump. The gas analyzer’s intake design and small sample cell volume (5.9 mL) provide excellent frequency response (4.3 Hz cutoff frequency) with low total system power (12 W). Additionally, the vortex intake (United States Patent No. 9,217,692) greatly reduces maintenance and maintains frequency response compared to traditional inline filters. The gas analyzer’s small sample cell volume (5.9 mL) minimizes the sample residence time (50 ms at the system’s nominal flow rate, 7 LPM). This gives excellent frequency response (5.8 Hz half-power bandwidth) with low total system power (12 W). CO2 and H2O are measured with an EC155 Closed-Path Gas Analyzer. Three-dimensional wind speed and sonic air temperature are measured with a CSAT3A sonic anemometer head. The 24.9 x 34.0 cm (9.8 x13.4 in.) enclosure houses the EC100 electronics and the CR6 datalogger attached to the lid of the enclosure. The CPEC300 enclosure can be mounted to a tripod mast, CM106 tripod leg base, tower legs, or a large-diameter pole. The pump module, a standard component of the CPEC300 system, consists of a small dual-head diaphragm pump with a brushless dc motor mounted inside a fiberglass enclosure. An integral cable connects the pump module to the CPEC300 system enclosure, which provides power, temperature measurement and control, pressure measurement, and pumping speed measurement and control. This download is for the CR6 datalogger. Execution of this download places the Operating System file(.obj) on your computer. It also updates the CRBasic Editor compiler and support files. Note: Campbell Scientific always recommends updating operating systems on site if possible. When remote updates are required, it is recommended that you implement the necessary precautions to handle unexpected OS upload complications. All datalogger settings should be retained when updated remotely. If you choose to roll back to a previous operating system, the datalogger settings will be reset to default. CR6 datalogger program for Campbell closed-path eddy-covariance systems. Note: This version corrects the compile error that the previous version had with the GPS instruction. Can the CPEC310 Scrub Module as a source of zero gas be used with the CPEC300 or CPEC306? No. A valve module is required to use the Scrub Module. Only the CPEC310 comes with a valve module.